During the last weekend of Marchs the first session of the ‘Hot Summer of Psychogeography’ (or Guy Debord’s dérive in 2002) took place in Amsterdam. 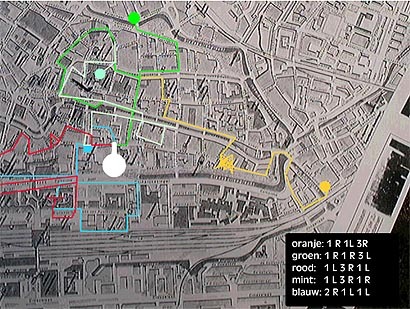 Socialfiction, the organisers, sent participants on their way from Dam Square with an algorithmic description of the route. The same experiment was repeated later in the day in the Bijlmer district. Last Saturday's generative psychogeographic walk took participants from Dam Square into the busy centre of Amsterdam. As it turned out, a number of groups ended up back at Dam Square after about an hour. That didn't happen later in the day in the Bijlmer district, where groups used the same formula to follow routes. Since Bijlmer has no clear street pattern, different routes took people past the same point repeatedly. The number of words to be seen was one striking difference. While the city centre is littered with ads slogans and all sorts of do's and don'ts, Bijlmer is wordless. All they found was a sign on an out-of-the-way plot that warned: No Loitering. But wasn't that the point of the whole session? Some participants filmed and taped proceedings. The questionnaires completed afterwards are now being processed, and the findings will soon be posted on the Socialfiction.org website. Similar experiments are planned in other European cities this summer to unravel the structure of these cities. Here follows a short report from one participant: My route was determined by repeatedly taking the second turn right, first left, and first right. By following this rhythm, first amongst the Saturday fun shoppers in the centre of Amsterdam and later in the emptiness of Bijlmer, you experience the finely structured maze of city-centre streets retroactively. It's not unusual to wander through the city. Your chosen route is no different or ridiculous from that taken by anyone else. The Bijlmer lacks all raison d'être in terms of streets and lanes. The second right takes you back to the park you've already passed on all sides, first along the cycle lane and then the gently curving footpath. From the 1970s on, the notion of dérive continued to inspire people, but more at an academic level and rarely as genuine action. The curiosity to discover all aspects of the city developed within Urban Exploration, a network that reports on urban voyages of discovery all over the world on the internet. Its success lies mainly in its illegal and spectacular character. In a response to sensation seeking, those within the Dutch organisation Socialfiction.org, headed by Wilfried Hou je bek (literally: Wilfried Keep-your-bloody-mouth-shut), developed Generative Psychogeography. This focuses on strolling around the city according to a generative algorithm (i.e. one that evolves over time) with the aim of (re)discovering the environment. The first experiment was a trip through Leidsche Rijn using a map of Rome. Since this didn't live up to expectations, they soon wanted to roam a city without preconceived notions. So they devised a method similar to how John Cage directs music: 'directions but no map'. John Conway's Game of Life provided the answer. No matter how simple the rules are, you can never predict how an animal colony will develop. You can only observe what happens. With that in mind, Socialfiction.org composed a set of rules that marks out an endless city route and surprises the psychogeographic stroller as to the logic of the drift-algorithm. Three experiments were conducted in the summer of 2001. The directions given to participants were variations on the formula: second right, second right, first left, and repeat. 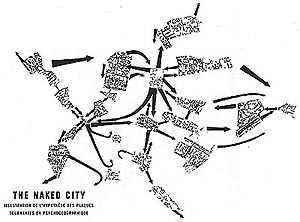 Situationist Guy Debord devised the notion of psychogeography in the 1950s. It deals with the study of the exact laws and specific effects of our geographic environment. Psychogeography describes the sudden change in atmosphere a few metres further along a street, and the different characteristics of city districts. It reveals the path of least resistance a person subconsciously takes when wandering aimlessly and points out the attraction or repulsion of particular places. One of Situationism's practices is the dérive (literally: wandering or drifting), a technique of rapid passage through varied environments. Involving playful-constructive behaviour, dérive examines psychogeographical effects and is thus quite different from the classic notions of journey and routing. Dérives weren't random; they challenged the psychogeographer to use his powers of imagination to experience the urban environment anew – for example, by following scents or negotiating a route through Paris armed with a map of London. What propelled these strollers was not so much curiosity but political and theoretical motivations.